Nope. No way. I’m not watching Katie Holmes pretend she can act for 90 minutes. Who in their right mind would view this expecting it to be good? I know any movie has the power to surprise, but I would be shocked if this one was anywhere near watchable. What a terrible name for a movie. And, just so you know, the plot has barely anything to do with games or with assassins. If you want your movie to be taken seriously, you ought to think about audience reception. You hear a title like this and you immediately start thinking b-movie. Which hey, don’t get me wrong, I love, but do they have to be so obvious? It’s not like this is a farce or a mockery of the genre, it’s a legitimate action film with an interesting plot; someone dropped the ball. And actually, the film has an alternate title, Gauntlet, which sounds cooler & makes a ton more sense. But maybe it’s just me, maybe everyone else is fine with the name. Regardless, the show must go on, and on it bloodily did. David awakens on a heap of corpses. He doesn’t know where he is, how he got there, or who did this to him. All he knows is that he’s in some type of dungeon with weapons & dead bodies and he would like to get out as soon as possible. But first he meets Jin, an Asian-American man from Jersey who is just as terrified & confused as David. The pair soon agree to help one another, attempting to find a way out. Soon they stumble across Emma and Tyler, another duo of horrified travelers who have no clue as to why they’re here or where here is. And so a foursome is formed, each with a weapon to protect themselves from whatever might pop up around the corner, each with a secret which may hint to why they’ve been imprisoned in the first place. Their surroundings are like a satanic prison, with torture devices and evil paintings, clues perhaps to the answers they seek. Although, answers can wait, what the group wants now is food, water, rest, and a way out of the dark abyss that they are trapped within. To make it out they must solve gruesome puzzles, attaining keys to allow them out of each level, moving closer & closer (supposedly) to life & a way out. But first they meet the last member of “game”, Kim, a suspicious woman who is definitely not telling everything she knows. Hers might be the most twisted back story, but through flashbacks we begin to understand that no one is innocent here, that everyone has something to hide, and perhaps they are all in this hell for a reason. What a strange movie. The title really did throw me off, partly because it just sounded crappy and partly because I was ready for a game or assassins or a combination thereof. But that’s not really what it’s about. The movie is more of a gauntlet for sure, a survival inside a test that will kill you if you fail. It was a little like the Gauntlet video game of the 80s, if memory serves. It’s been a long time since I played, but I remember the characters, the levels, the keys to each new challenge. I guess that describes a million games, but the alternate title of this film leads me to believe there might be some slight connection or at least a nod in that direction. At times even the action was visually game-ish, with obviously fake blood and unrealistic weaponry talent. The set too felt like a video game, like a Zelda dungeon level, like a board you had to figure out so you could get to the boss. Except, in this film, there were no bosses, only the characters, who will need, use, and kill each other whenever it’s beneficial. So that aspect I liked, that it took me back to my childhood when dark fantasy video games were super cool. But it’s still a film, an action flick that needs to be judged as one, and that’s where it came up short. All the different characters were interesting, but it was unfortunate that every one was badly acted. I guess I wasn’t expecting much from a movie of this caliber, but a little more effort would have been nice, a little stronger attempt to build the depth of the roles and not just superficially let us know that everyone has demons. And the ending, as much as I can say without being a spoiler, was bad. I could see a hundred different paths that I would have enjoyed more, a hundred different story arcs that would have made me happier. Instead, what we get is a bunch of strangers trapped somewhere creepy, some difficulties getting out, and an unsatisfying conclusion. Yep, sounds like a video game, and not a great one. At least it was kinda fun playing. Video – With an aspect ratio of 2.35:1 (16×9 Widescreen) you’d expect better, but what you get is something far worse. The video was very poor, with bad camera work, too-tight spaces, and bad color. The picture quality in general was bad; grainy, uneven, and not at all visually appealing. Fake blood, dirty dungeons, limp bodies; pretty amateur stuff. Audio – As far as options go, the DVD allows the viewer to turn on English or Spanish subtitles; there are no more audio choices. The sound quality was pretty awful too, with a muffled feel, an unbalanced mix, and unimpressive work in general. Extras – There are a couple extras on the disc. Three deletes scenes give a little more insight into the plot: What is a Gauntlet, Stay Away From Me, Not Once. There are also four trailers: Game of Assassins, No Vacancy, Alpha Alert, Brawl. Rent It. Game of Assassins is not at all what its title or DVD cover might suggest. It’s not fantasy exactly, it’s more horror, and it’s definitely not a b-movie spoof. It’s an action film that tries to tap into the human mind and make us feel trapped right alongside the characters. Well, I liked it for its video game feel, but I can’t say to much in defense of the rest. It isn’t a well-made movie, but it’s also not crap. There are cool aspects to latch onto if you’re willing to forgive a lot of failings, making it a cheap rental and nothing more. God I hate Nicolas Cage. As a kid I was a fan of John Wayne; as an adult I’m a fan of the Coen Brothers. 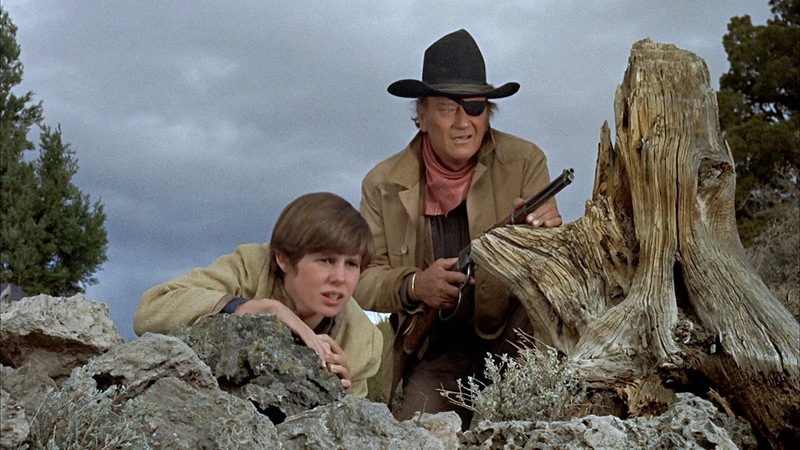 When I was young I watched all the old Wayne Westerns, including True Grit. His role as Rooster Cogburn is beyond iconic, marking not only a film but a time, an era of the elder Wayne only ten years before his death. More recently I watched the remake, the Coen Brothers version of the classic. It stayed very true to the original, marking up the humor a bit perhaps, something that was present in but didn’t define the original. So now I’ve rewatched the first, gone back in time as it were, and perhaps learned a valuable lesson in so doing; some movies are best left where there lay. When her father is killed out of hand by the lowly Tom Chaney, a young girl named Mattie Ross sets out on an adventure to see justice done. She’s no ordinary girl; she’s got grit & determination, qualities she seeks in a lawman who can help her see her father’s killer hanged. She finds the man she wants, though he may not want the job. His name is Rooster Cogburn and he’s a drinker, a brawler, and perhaps the best Ranger in the territory. Teaming up with a Texan named La Boeuf, the trio travel to find Tom Chaney no matter where he might run. But trouble is certain. Chaney has powerful friends, including an outlaw named Ned Pepper who Rooster knows well, and won’t come willingly. So battle ensues and may the best man, or lady, win. It’s a comfortable plot, one that’s been told in Westerns for years; man kills man, posse chases killer, gunfight climax. There are a lot of dated names thrown around, cities & forts, Civil War references; all the standard stuff. But what sets True Grit apart from the rest is Mattie, the girl who forces herself into a man’s world through pure gumption. She won’t take no for an answer and somehow makes that believable, supporting the movie single-handedly. There’s a little bit of humor, a touch of sass, some cool shooting scenes, and a bunch of horse-riding. Nothing too far away from the norm and nothing much surprising at all. John Wayne is just OK as Rooster, sometimes coming off as a buffoon, sometimes as a hero. Kim Darby is solid as Mattie, playing the part with guts. And a couple future stars pop up; Robert Duvall, Dennis Hopper. All in all a strong western with a comedic side, but nothing that will blow you away. I don’t often laugh out loud at a trailer, so congrats to Mortdecai. I’m not sure what else I could ask for from a comedy; Johnny Depp as a silly British rogue, art thievery, Paul Bettany as a bloody manservant, caper antics, the beautiful Olivia Munn. I don’t even mind that amateur director David Koepp might “borrow” a little bit from Wes Anderson here, in particular The Grand Budapest Hotel. I would watch this movie right this minute if it were available to me. It’s safe to say that movie audiences are a little obsessed with dystopia right now. The Hunger Games, Divergent, The Giver; young adult novels are more popular than ever, especially those that deal with a post-apocalyptic future in which teens struggle for their mental or physical survival. And adults aren’t immune to this movement. I read The Hunger Games series, the City of Ember books, saw all the film versions; they sucked me in with the rest of the country. 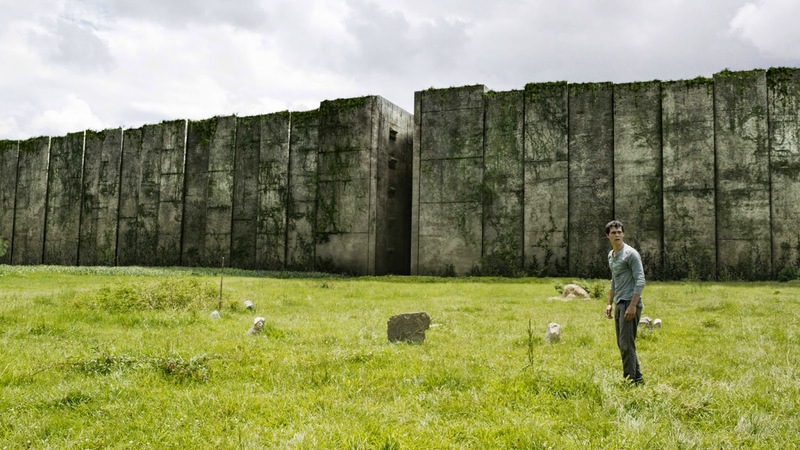 And now we have The Maze Runner, another teen book trilogy set in the near, unhappy future. Kids fight for their lives, battle incredible sci-fi monsters, attempt to figure out just what the hell is going on; pretty typical stuff these days. But this film, unlike some of the others, did one thing terribly wrong and so failed to win me over; it forgot to let me in on the joke, to tell me the truth, to give me an outside overview. I’m still trapped in the maze, and I’m not very happy about it. Thomas doesn’t know who he is. He doesn’t know why he’s in a field surrounded by high walls, he doesn’t know who all these other boys are, he doesn’t know what happened before this current moment, and at first he doesn’t even remember his own name. He’s been thrust into a completely foreign world; only the first of many terrible things that are about to befall him. The others tell him that they were all delivered to this grassy plain the same way, through a Box in the ground. They call their home the Glade, which is surrounded by the Maze, a labyrinth of ever-changing walls that they assume leads to the outside world. Members of the tiny society called Runners have been tasked with mapping the Maze, leaving at dawn when the gates open and returning at sundown when they close. For years the boys have been trying to solve the puzzle of their situation, but perhaps Thomas is the key. He and a girl who follows him up the Box seem to be special, to be involved in some unique way, and to have the ability to finally defeat the Maze, its dangers, and its secrets. Despite the unoriginality of the concept, I was actually hopeful that The Maze Runner would be a solid film in a popular genre. Obviously it’s awfully similar to The Hunger Games: Catching Fire; the arena, the death traps, the desire for freedom. But actually James Dashner’s book came out in 2007, two years before Suzanne Collins’ second novel. Not that it matters; all these teen dystopic stories feel pretty similar and often share the same ideas. I just hoped that this particular one would come off more Stephen King than Veronica Roth. Well, it did, but only kinda. It left out the sappy love story, stayed dark, killed off characters, so for that I give it credit. But it failed to escape the banality of the modern YA sci-fi genre that seems to be haunting both literature and film. It wasn’t fresh, wasn’t a new take, wasn’t surprising, didn’t excite. It brought us more of what we’ve already seen; cold-hearted controllers, angsty youth, a harsh society of drab lives, and very little faith that things can get better. Something original would have been greatly appreciated; sadly there was nothing. And don’t forget the details; those were bad too. The action was horribly filmed. 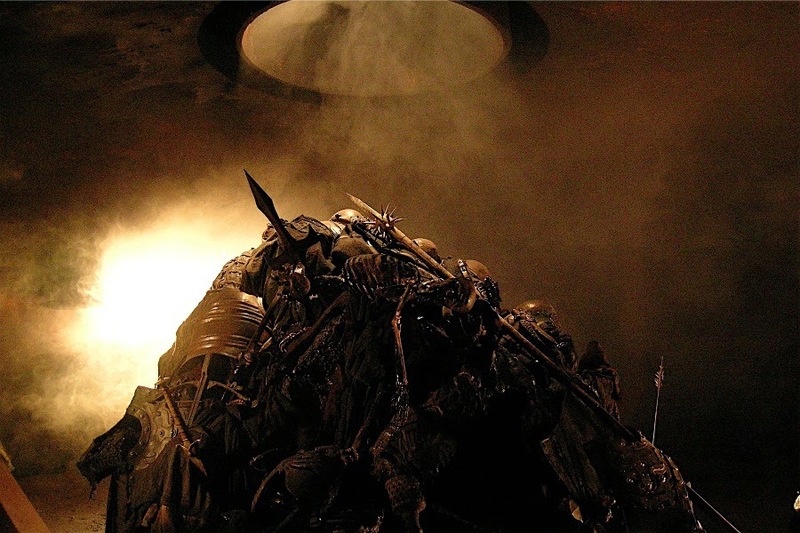 It was too messy, too close up, too dark; I could never see the movements of the characters clearly when they were fighting against the evil Grievers, mechanical bug-things that prowled the maze. Just pan back, show a bit more detail, let us see how the boys could possibly fight off giant machines using their tiny sharpened sticks. That was a problem throughout; the insistence from the film that audiences don’t ask questions. A character actually said at one point, “whatever you can think of to try to escape we’ve already done.” Oh really, like building a scaffold to reach the of the wall, a job that would take three days, not three years? The film was littered with similar plot holes, and even failed to wrap up the over-arcing story. I understand that there are two more books in the series and that I’ll probably have to read those or wait for the other movies if I want to know all the answers. But shouldn’t I, an intelligent adult, be a little less confused after watching a film that was meant for tweens? The end of the story only adds more questions, more non-specific references, more frustrating teases that didn’t make me want more, but rather made me want to go back in time so I could watch less. Figuring out this film was like being trapped in a maze myself; watching it was like revisiting every post-apocalyptic movie ever made. Unless you’re a 13-year-old, I’d recommend staying away from The Maze Runner; you won’t miss anything but dissatisfaction. Click on the director’s name above and take a look at all that he’s at least partially responsible for. Not good. And not reassuring either, not when you start wondering whether this historical drama will be honest or cheesy. I’m very interested in the Civil War, would watch most movies about the topic, but I’m a little nervous about this one. 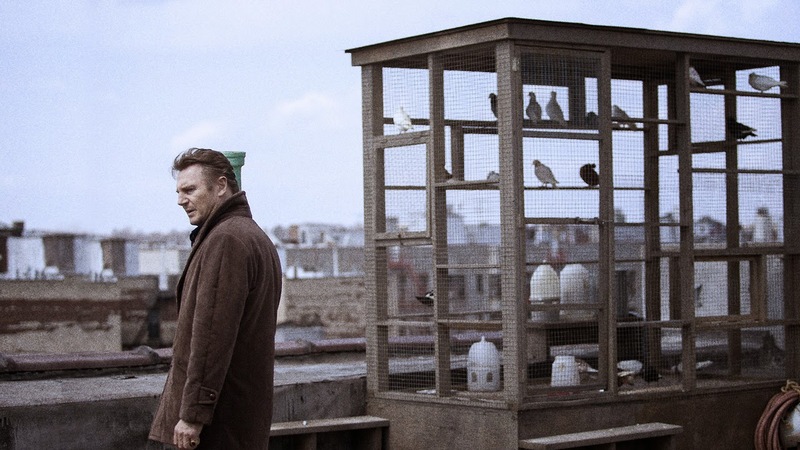 Liam Neeson is always walking around very carefully with a concerned look and a gun. I guess I would too if I was constantly hunting dangerous people around corners and in tight spaces. This seems to be his role these days; the cop/ex-cop/special agent/ex-special agent who has some dirty work to do and doesn’t mind shooting his way through it. 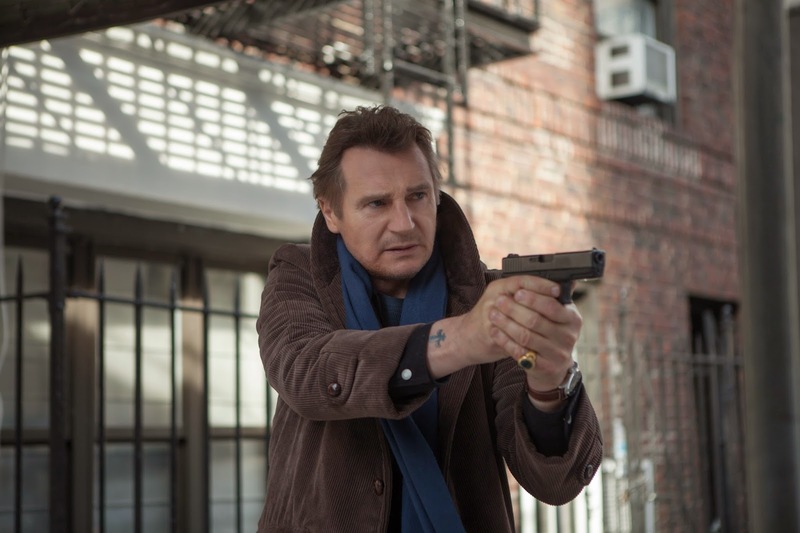 Taken, Taken 2, Non-Stop, A Walk Among the Tombstones; these are the movies that Liam is in these days, and it’s up to us to understand what we’re about to see when we step into the theatre. This film isn’t a shocker in any way, it’s just another in a long line of good guy vs bad guy stories that entertain us even though we know they’re actually not very good. The plot begins eight years earlier than the bulk of the story, in New York City in 1991. Matt Scudder is a cop who is also an alcoholic, a guy with a problem that’s about to end his career. After a shootout with some robbers in which Scudder kills many of them while drunk, he sobers up and becomes a private investigator. Fast forward to 1999 and a murder that begs for revenge. A local drug trafficker hires Scudder to find a pair of men who kidnapped his wife, took his money, led him on a wild goose chase, and then killed her anyway. The search must be kept off the record for obvious reasons, and the ex-cop takes the job. But it’s not as simple as one kidnapping and one execution, there’s a pattern in play and a duo of psychopaths that will make this a hard case to solve & survive. With the help of a young boy from the streets, and using the instincts that have always served him well, Scudder will find the men responsible for the deaths of so many beautiful young women and bring them to justice. There is no way this film should surprise or disappoint anyone. It’s exactly what it looks like; a crime/killer/suspense/mystery/shoot-em-up movie whose goal is to entertain, if darkly, nothing more. Drug dealers, DEA agents, serial killers, hand guns, pay phones, graveyards, creepy vans; it’s got it all, what more could you ask for? I’m not saying that it’s a brilliant piece of cinema, of course not, but it never tries to be anything but what you can see on the surface and never let’s audiences down. By now you should know what to expect when going to see a Liam Neeson action film and be prepared in advance for what you are about to witness. Don’t come hoping for stirring depth or emotion, don’t look for a lot of laughs and karate moves. Sit for one-hundred minutes of gritty, bloody suspense and enjoy yourself if that’s your thing; stay home if not. 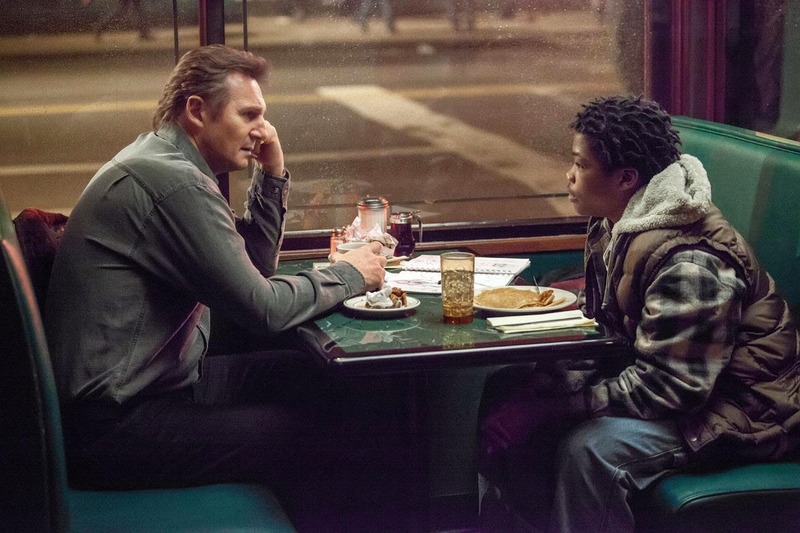 For me, it wasn’t the genre that I came for, it was Liam Neeson. I knew the movie wouldn’t be to my exact taste, wouldn’t blow me away with anything original. I figured it would be dark, cool, action-packed, perhaps throw-away. But I wanted to see Neeson; he’s a great actor. I know he doesn’t always participate in the highest quality projects, I know he’s getting a little long in the tooth, and I know some people find him a little bland. But to me, the guy can almost do no wrong. He always brings a certain swagger to a film, a special superior presence that can’t be faked. He’s got “it”, whatever “it” is, and he’s got it to spare. That’s why audiences always eat up the movies that he stars in, because yeah sometimes they’re not good, but he’s always there. He’s always looking at you from those Liam eyes, talking to you with that Liam voice, and no one will ever do things the way he does ’em. I for one will enjoy his semi-crappy films while I can because at least they entertain and he won’t be around forever. NYG @ Was – A very important Thursday Night matchup. These division opponents are both 1-2 and neither want to drop another game right now. The Redskins, now under Kirk Cousins, score more than the G-men, allow less, and are at home; a recipe for a win. Car @ Bal – I said last week that if the Ravens won in Cleveland I’d start giving them some respect. Well they did, barely, and now they get to head home to face the Panthers. I can’t figure out Carolina, when they’re gonna click or falter, so I’m staying away for the time being. GB @ Chi – Another division matchup in which the home team scores more & allows less. Cutler has been slinging the ball well, Rodgers has not, and this Packers defense isn’t very good. In such an old rivalry I doubt anyone gets blown out, so look for a close one. Buf @ Hou – The Texans looked to be back in the saddle until the Giants beat ’em up last week. I expect them to rebound after a return home. I’ve been on the Bills’ bandwagon since before the preseason, but they had a tough game last week and this one isn’t much easier. Ten @ Ind – The Colts got their first win of the season last week, but actually lead the AFC in points scored. They just had an unLUCKy draw (Den, Phi), but now get it a bit easier (Jax, Ten). The Titans only score 14 points per game; not enough to keep up at all this week. Det @ NYJ – Here’s a stat for you; the Jets have scored more points this season than the Lions. Say what?! That’s right, the mighty Stafford-led Detroiters have actually relied more on their defense this year to get wins. But they don’t play well on the road, and could lose in Jersey. 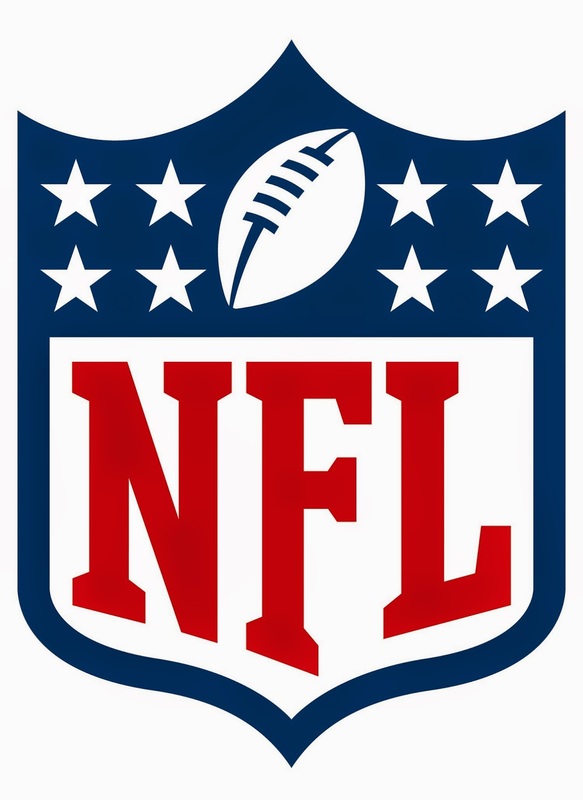 Mia @ Oak – Three of the four worst points-allowing defenses in the NFL play in Florida. The Dolphins are not having the kind of season they were hoping for, obviously. But the Raiders are winless, can’t score points, and look pathetic. So it’s a toss up; maybe it’ll be a tie? TB @ Pit – Speaking of bad Florida teams, the Bucs are awful. They’re 0-3, can’t score, can’t stop anyone, and have very little hope of salvaging their season. The Steelers aren’t incredible, but they should be able to win at home vs a very inferior team. Sorry, Lovie. Jax @ SD – Yes trap games are real, yes any team can win “any given Sunday”, but this week? I don’t think so. This is, by far, the biggest mismatch, as the Jaguars are reeling and the Chargers are on fire. Look for Rivers & Brown to score points in bunches without mercy. Atl @ Min – My first road team pick of the week. The Falcons are the best offense in football, thanks to Matty Ice. They usually play very poorly on the road, but hey it’s Minnesota. The Vikings lost Adrian Peterson, now Matt Cassel, and should lose this game pretty pathetically. Phi @ SF – Speaking of road teams that score points, say hello to the Eagles. Their vaunted high-flying offense is working just as well as people expected, and so far they’re undefeated. The Niners aren’t living up to expectations, but that can’t go on forever. I predict a change this week. NO @ Dal – The Saints are just a whole other team on the road. And you know, they’re not scoring like they normally do. Also surprising is the Dallas D, which isn’t as bad as it was supposed to be. I gotta go with the home Cowboys, especially with the way Murray is running. NE @ KC – Color me not surprised that the Chiefs aren’t that great. They were exposed at the end of last year and apparently it carried over. But Kansas City is a tough place to play, especially on the big stage of MNF, and I think the Patriots falter, losing a close one here.